Former Hearts and Inverness Caledonian Thistle boss John Robertson has been appointed Livingston's new manager. The 41-year-old has signed a contract until 2008 with the Scottish Premier League club. Livi have been looking for a new manager since Paul Lambert resigned on Saturday with Livi bottom of the table after his seven months in charge. Robertson, who started his coaching career at Almondvale, left Ross County in October after just four months. He departed Dingwall in protest at being asked to make major cuts in his playing budget with the First Division club. Robertson's task will now be to prevent Livi dropping down to that same division. The former Scotland striker, who spent four successful years at Almondvale as a player then coach under Davie Hay before moving to Inverness in 2002, was looking forward to taking charge for Saturday's trip to face Kilmarnock. 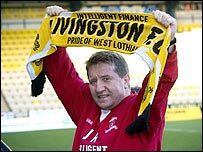 "I'm absolutely delighted that Livingston have honoured me with the chance to manage the club," he said. "I had a fantastic period here last time under Jim Leishman and Davie Hay, but that is gone now. "As far as I'm concerned, it's back to the future and the future is now. "We have the proverbial 12 cup finals to come, but this club can stay up and I'm here to make sure they do." Robertson becomes the sixth manager to take over at the West Lothian outfit in around two years after Marcio Maximo, Hay, Allan Preston, Richard Gough and Lambert. Youth team coaches Alex Cleland and Graeme Robertson will also assist Robertson for now as no new backroom staff will be appointed in the short-term. Saturday's 1-0 home defeat by closest rivals Dunfermline Athletic left Livi six points adrift at the foot of the SPL. Robertson was chosen from a final shortlist of three. Former Hibernian and Kilmarnock boss Bobby Williamson, axed by Plymouth this season, was also a leading candidate. Gordon Chisholm and Craig Levein, sacked by Dundee United and Leicester City respectively this season, and former Scotland boss Craig Brown had been mentioned as possibles. And speculation had linked former Republic of Ireland manager Brian Kerr and Shelbourne's Pat Fenlon, with Flynn admitting that there had been approaches from Irish candidates.